Penny’s education/experience is primarily marketing. A serious book lover and reader of books, she says “If I am a true expert at anything, it would be reading books”. 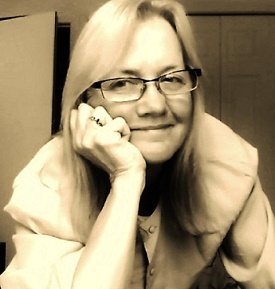 A consultant in marketing/writing/editing, her work time is spent alternately between clients and blog writing. She says “I’ve been the person behind the scenes first as a business owner of a marketing/advertising firm and then as a private consultant.” With several books in the works, she will be published in the near future. The following she wrote for fun. It is for those young at heart who are familiar with Dr. Seuss, his birthday was this week, and of course the famous television series “Dr. Who”. I hope you enjoy. The day started out simply pleasant. In fact Horton knew it was great. but rather “Dr Who” that arrived. In his TARDIS he came. and then, of course, at Dr Who. Of course Dr. Who replied, “Brilliant! and once again at Doctor Who. “and most happy to meet you am I. Now Horton, as you know, is a thinker. the Daleks were bad guys, he knew. back to whenever they were from. Sarah says: Many thanks, Penny, for contributing this most amusing children’s story-in-rhyme to the guest storyteller slot this month. I’m a huge fan of both doctors, Seuss and Who, as are my grown-up offspring and my grandchildren. It might interest you to know that I’ve watched every episode of Dr Who since its debut screening on British TV on 23rd November, 1963. After the first series, I had to suffer my younger brother walking around in a Dalek costume, threatening to exterminate me! Wonderful poem this Penny! I used to read Dr Suess books all the time to my children and remember Horton well. 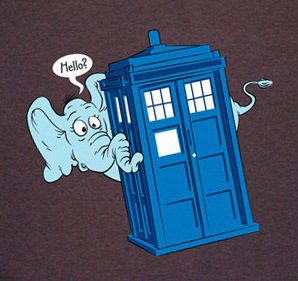 A very clever merging of Horton and Dr Who I must say 🙂 Although I adored Dr Who as a child – despite being petrified of the Daleks and the Cybermen (and had to laugh at the image of your brother chasing you Sarah in his Dalek outfit!) but I’ve never seen any of the new ones! Not sure why. But I will never remember those days of hiding behind the sofa and who can forget the music when the Tardis appeared? Great stuff, wonderful post, thanks Penny and Sarah!! Being a tomboy as a child, who liked reading “Amazing Stories” (some very freaky ones, like a wall of flesh that sucked passers-by into it), the Daleks and the Cybermen seemed very un-scary in comparison. My brother certainly failed to frighten me with his Dalek costume — only irritate me, as little brothers can do. What did scare me was the wolf in Little Red Riding Hood. One of my relatives gave me a book that had a horrid wolf on the front cover, all shaggy with the meanest teeth ever. When I had a high fever once, I saw the wolf sitting by my bed, preparing to pounce and eat me. I could even smell its breath and hear its growling. It was so, so, so real. Later, when working in psychiatry, the memory of this experience gave me an inkling of what some schizophrenics must suffer, re terrifying hallucinations. I’m glad…and no wonder, your poor sweet puppy… best to keep well away. She nearly died from an abscess that formed as a result of a bite. Being a Labrador puppy, she wanted to be friends with every dog (and cat!). I guess her experience with the Alsatian would be classed as near-fatal trial and error learning. The same went for when a vicious tomcat ambushed her and chased her around a lamppost. I guess it’s the same as for humans — the baby born innocent, then the toddler, then the schoolchild, slowly learning that they can’t trust everybody. Sad, but necessary for survival of the species. Fun stuff! Must share this with my nieces who are big Dr. Who fans! My granddaughter was so in love with David Tennant when he played the part of the Doctor, that she spent all her pocket money, plus birthday and Christmas money, on Dr Who memorabilia. To her great good fortune, there was a shop dedicated to him within walking distance of her house! So in our family we have three generations of Dr Who fans. The same goes for Monty Python’s Flying Circus. In fact, with the latter, it’s four generations, as my mother is a fan, too. I love things that stand the test of time (not an intentional pun there!). Indeed. At last year’s ComiCon, my nieces (both of them animators with a booth) met members of the show. They were thrilled, to say the least! Indeed! Between that and meeting “Daryl” from the Walking Dead (one niece drew a picture of him and gave it to him) – they were fit to be tied! Fabulous! Worthy of publication with bold lively illustrations and placed proudly in the children’s section.